As winter begins it cool decent into New York I start to think about the holidays. Though I despise the cold, the holiday season has always been a special time of year. Perhaps it is all of the beautiful lights in the city, or maybe it is because it causes me to reflect on those important in my life and to be thankful for my family and friends. Every Thanksgiving my husband’s family and my family have a big meal together (rare, I know!) However, before that happens I have a tradition with my friends in the city. We call it Friends-giving (as do many other people). I love this for a few reasons. First, because it allows me to select a key group of my friends that are most important to me and share a mock Thanksgiving with them. After all, friends are the family you choose, right? 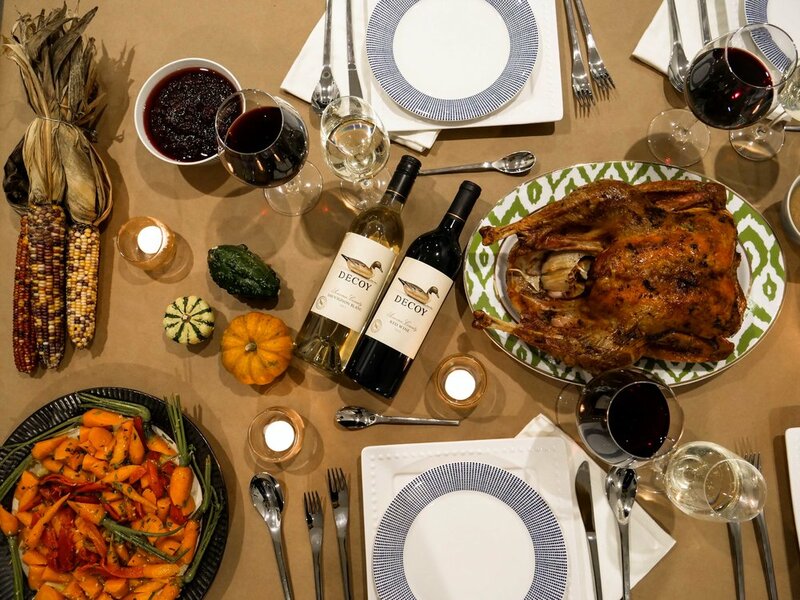 The second reason that Friendsgiving is important is because it allows Luis (my husband) and I to try out new appetizers, main courses, sides, desserts and wines with our friends and then introduce our favorites to our family on actual Thanksgiving Day. Doing this strategy has introduced us to unique, innovative dishes that my mom would never normally incorporate into a traditional meal. This Friendsgiving, Luis and I had an intimate dinner with our friends Andre and Kenna to celebrate them moving in together for the first time. I love their New York apartment because it has a Texas chic vibe and a rare outdoor patio. Ask any New Yorker their thoughts on having an outdoor space and I promise you they will say it is one of their dreams to have that in an apartment. It is always wonderful when your friends have something that special! For our dinner, I brought a few bottles of Decoy wine to elevate the occasion. They have a red and white that I thought would pair perfectly with our creative Friendsgiving menu that evening. When I pulled out the wine I was shocked when Andre mentioned that he has been drinking it for years and it is one of his favorites. What a relief! I poured us all a glass and quickly became obsessed with their red blend. It reminded me of Argentina when Luis and I stayed at the Vines of Mendoza last year. Naturally one of the key parts of a Thanksgiving meal is preparing it. Though I don’t cook, luckily, Luis does. I always say I’m the luckiest girl to have a husband that is infatuated with trying new foods and dishes. It makes meals fascinating! Earlier in the day I searched the web and found a few one-of-a-kind thanksgiving meal variations that I thought could be fun to try. The first was roasted turnips and greens with bacon vinaigrette. This dish ended up being Kenna’s favorite. Next was Moroccan carrots with Aleppo pepper and mint. I adored this side because it reminded me of my travels to Marrakech. It was served chilled. Another side was a variation on typical mashed potatoes; whipped mashed potatoes with celery root. Truly I had no clue how this one would taste but thought it would be fun to try something different. It came out perfectly. The potatoes were fluffy with a creamy taste and slight hint of celery. I am a big fan of this one and plan on suggesting this to my mom for actual thanksgiving. Of course, the main event was the turkey. Luis had never cooked a turkey so we were all curious how this would come out. After ample Google searches and several glasses of Decoy wine, we pulled the turkey out of the oven to reveal his masterpiece. It came out beautifully and Andre and Luis even made a gravy to pair with the whipped potatoes. To top of the night (as if we didn’t top it off with unbelievable amounts of delicious Decoy wine), we had a Pecan Pie from the famous Little Pie Company. Though we didn’t make this one, it still had a special place in my heart because the shop is such an iconic New York spot. Thanksgiving with my family in upstate New York would never incorporate a local NYC shop in it so this was a fun way to add a city twist to our meal. After finishing the bottle of Decoy wine, we called it a night. It was the ideal Friendsgiving and I look forward to bringing back my learnings to my family for actual Thanksgiving this November 22.